You know that movie You Don’t Mess with the Zohan where the guy uses hummus for pretty much everything? Well, my obsession with hummus is pretty much at that level (minus using it for non-food purposes). I moved beyond eating hummus as a dip years ago. Hummus gives an almost creamy flavor to food without the use of any butter, cream, cheese, or animal based ingredients. For that reason it also makes a great “sauce” for pasta. 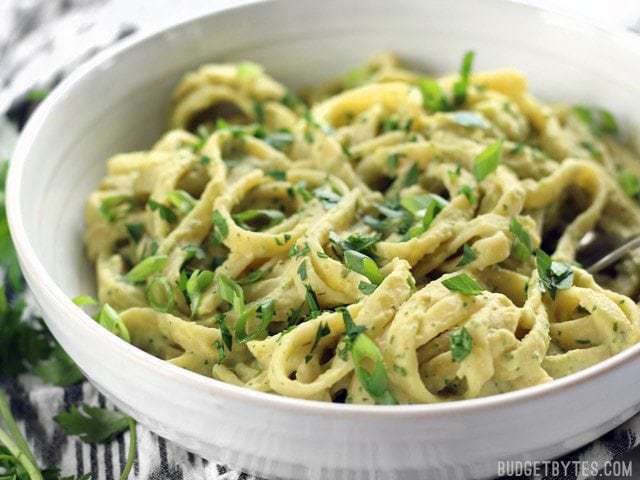 For this Parsley Scallion Hummus Pasta I used fresh parsley and scallions (green onions) to flavor my basic homemade hummus and give the pasta a really nice fresh, summery flavor. 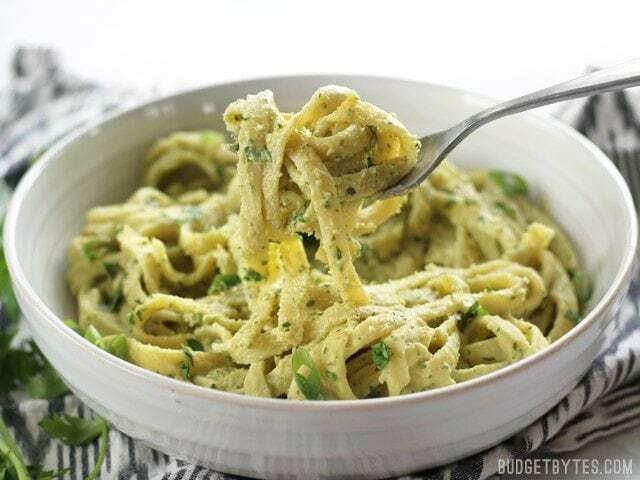 Parsley Scallion Hummus Pasta - Fresh parsley scallion hummus makes a wonderfully creamy vegan pasta sauce for summer. 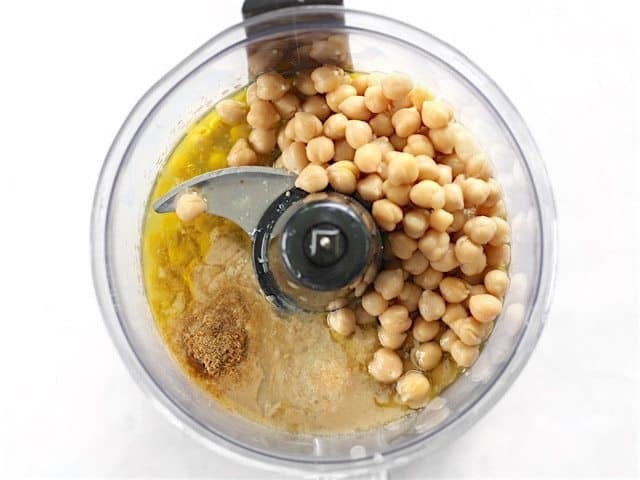 Drain the chickpeas and add them to a food processor along with the olive oil, juice from the lemon (about 1/4 cup), tahini, garlic, cumin, and salt. Pulse the ingredients, adding a small amount of water if needed to keep it moving, until the hummus is smooth. 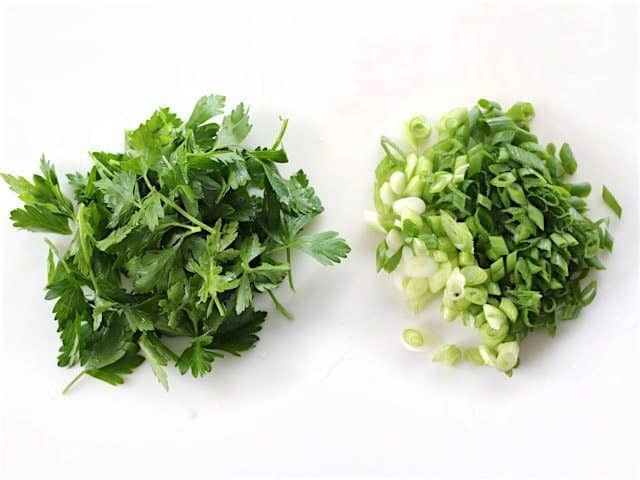 Slice the scallions (both white and green ends) and pull the parsley leaves from the stems. 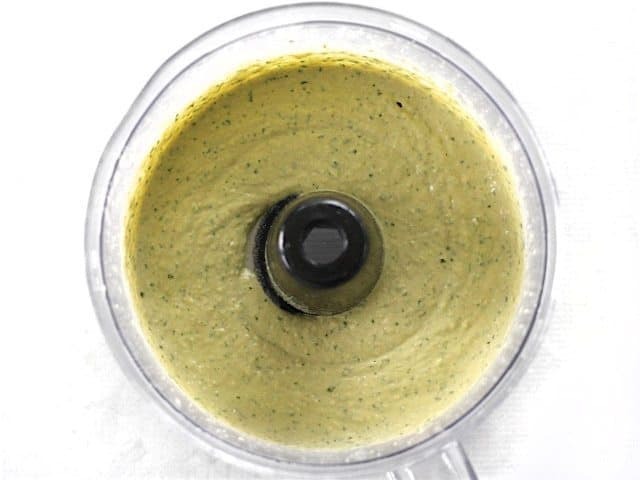 Add the green onion and parsley to the hummus in the food processor and process again until only small flecks of green remain. Taste the hummus and adjust the salt, lemon, or garlic if needed. Cook 8oz. of your favorite pasta according to the package directions. 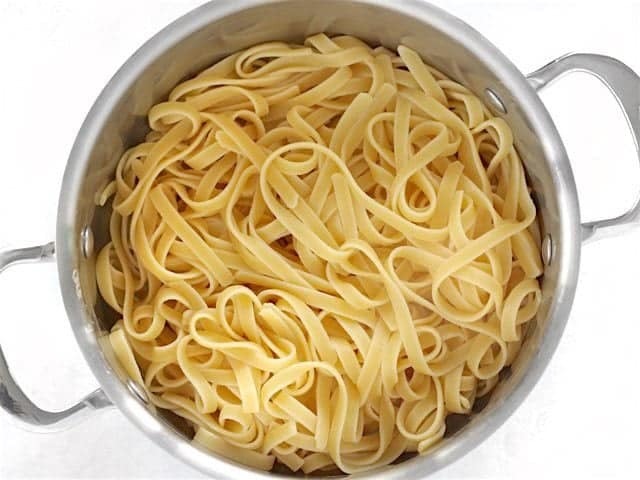 Reserve one cup of the starchy cooking water, then drain the cooked pasta in a colander. Return the drained pasta to the pot with the heat turned off. Add about 3/4 of the hummus to the pasta and stir until the pasta is evenly coated (add more hummus if needed). Add the reserved pasta water as needed to keep the mixture smooth and saucy. Serve immediately. Start by making a basic batch of hummus. I used my Homemade Hummus recipe, but increased the amount of olive oil because I knew it would need a little more lubrication as a sauce for pasta. So, start by draining a 15oz. 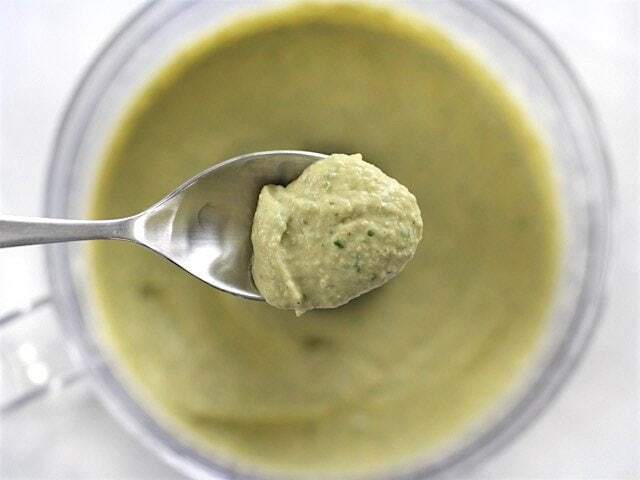 can of chickpeas and adding them to a food processor along with 1/4 cup olive oil, 1/4 cup lemon juice (fresh, if possible), 1/4 cup tahini, 1 clove garlic (or 1/4 tsp garlic powder), 1/4 tsp cumin, and 1/2 tsp salt. Process these ingredients until smooth. You may have to add a couple tablespoons of water to help it move as you process. Slice two green onions (both the white and green ends) and pull the leaves from a large handful of parsley. Add the parsley and scallions to the food processor with the hummus and process again. Process until there are only small flecks of green. Taste the hummus and adjust the salt, lemon, or garlic if needed. I rarely need to tweak, but if you do this is the time to do it. Cook 8oz. of your favorite pasta shape according to the package directions. Save 1 cup of the cloudy, starchy pasta cooking water before you drain the pasta in a colander. Return the drained pasta to the pot with the heat turned off. Add the hummus to the pasta (start with about 3/4 of the batch and add more as needed) and stir to coat the pasta in the hummus. Add some of the reserved pasta water to the pot to help keep the hummus smooth and saucy (the hot pasta will dry the hummus out a bit). 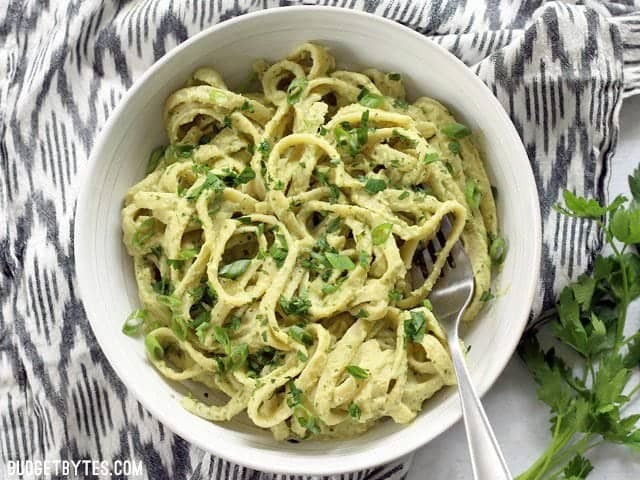 Parsley Scallion Hummus Pasta – Think outside the box when it comes to hummus! I have some delicious hummus I need to use up–how much would I need for this dish? You’ll probably need about 1.5-2 cups. Tahini at my local grocery store is nine dollars a bottle, and that’s just way too much for my taste. Do you have any suggestions for substitutions, or would it be fine just to skip it? Personally I don’t think hummus tastes like hummus without the tahini, but some people do substitute natural peanut butter for the tahini in a pinch. If you can find sesame seeds for cheaper you could always try making tahini yourself, it’s super easy. 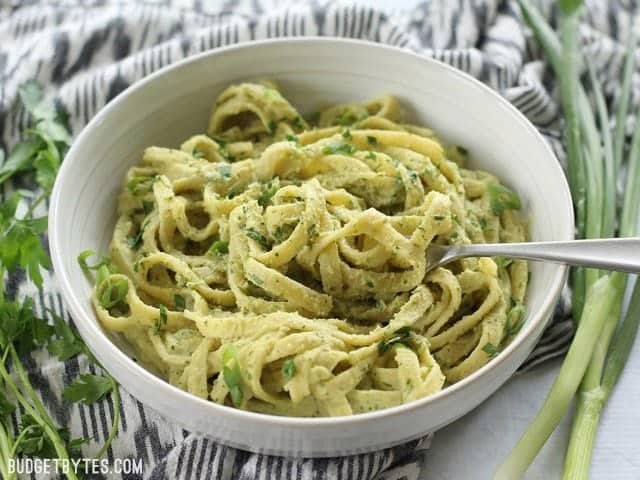 Thank you so much for posting this awesome recipe! I can’t have dairy and miss cream sauces on pasta, this was a great substitute. I added sauteed summer veggies and they were a perfect pairing. Your website rocks! 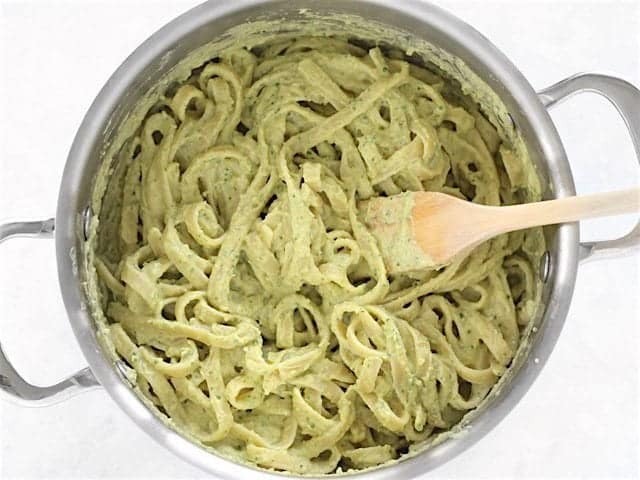 I’ve made a similar dish before with zucchini noodles. 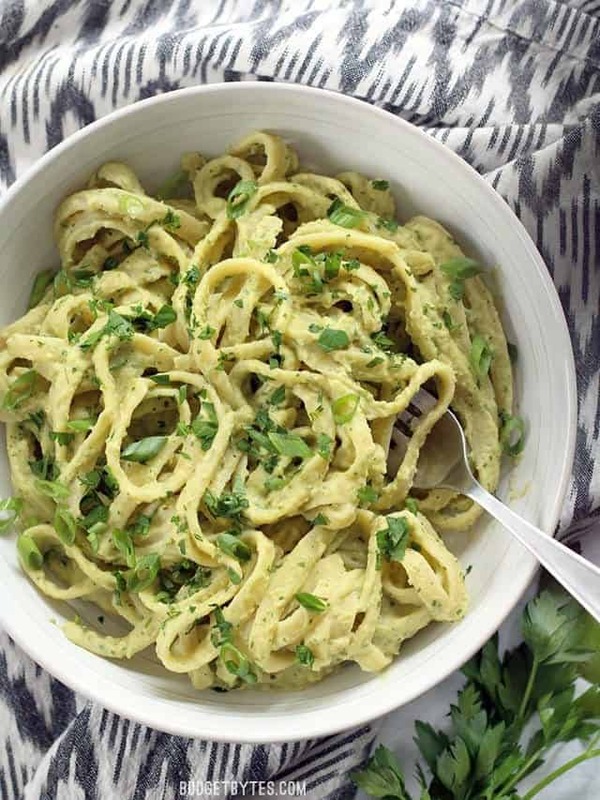 It’s amazing all the things you can do with hummus.